Andrew with Lee Phillips, M.D. Like Nemo’s “lucky fin,” 3½-year-old Andrew has a special left hand. In fact, he’s just starting to notice when he counts his fingers that one of them isn’t there. But he’s cool with it. So are his parents. “Just keep swimming,” as they say in Finding Nemo. Andrew was born with radial longitudinal deficiency. It shows up as either an underdeveloped thumb or an absent thumb or sometimes a shortened or partially developed radius, which is the bone on the thumb-side of the forearm. Radial longitudinal deficiency occurs in one in 100,000 births. Grasp patterns are important for picking up objects, use of developmentally appropriate tools including spoons, forks, crayons, scissors and pencils and participation in play activities such as building with blocks, throwing a baseball and coloring. Phillips discussed treatment options in-depth with Andrew’s parents, and they decided on a pollicization, a surgical technique in which Phillips removed the thumb and replaced it with a relocated index figure, which would act as a thumb. Phillips is one of only a few surgeons in the area who performs this particular tricky surgery. Andrew had a cast on his arm for several weeks and followed up with therapy on the hand. Andrew has one more surgery scheduled for early 2019 on his other hand. 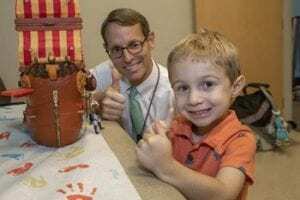 During Andrew’s initial visit, Phillips noticed several joints that were underdeveloped in his right hand and recognized that improvements in functionality could be made with a minor surgery once he had grown a little and his bones were larger. So far, Andrew’s classmates haven’t noticed the hand, but Phillips has prepared the family for potential bullying. “It was a pleasant surprise that Dr. Phillips asked about it, and it reassured us that he will be there for support in helping us deal with it if and when it occurs,” Megan says. Phillips explains that talking the child through the differences in his hand and the benefits that brings him can help prepare him to answer questions when the time comes. The family is very pleased. Soon he will have two fully functional hands, making gymnastics even more fun.